Carlton Hollow Apartments is Saratoga’s newest 55+ apartment community, combining upscale apartment living with community amenities that offer fun and fitness year-round. Take advantage of the indoor two-story pickleball court, work out in the exercise room or go for a swim in the indoor pool. Afterwards, relax in the sauna and let your stress melt away. Step outside the fitness center to the covered patio overlooking the picnic and barbeque area. Pack a mug and enjoy your coffee outside with friends. Whether you are in the mood to socialize or find a quiet spot with a book, you can choose any of the community’s specialty common rooms for a space that suits you. You and your friends will enjoy the lounge, movie room, billiards, game room, beauty salon, and large community rooms. Our library offers comfortable seating and a quiet atmosphere. In your apartment, you will appreciate the open living area to entertain friends. Your new apartment will feature nine-foot ceilings, a kitchen with granite countertops, stainless steel appliances, and a breakfast bar to enjoy your guests. Linger in your living room then continue the conversation by stepping out onto your private balcony. Our location allows you to take advantage of everything the area has to offer. 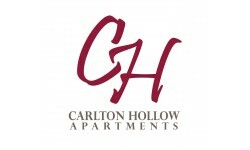 You will find so much to do inside and outside of Carlton Hollow for fun and fitness year-round!